Vizrt's new Viz Engine 3.11 renders in full HDR color, adds motion for AR, and uses the latest streaming technologies. Vizrt is leading the way into IP production with new levels of its key software that bring impressive new functional capabilities. For the card to work, two additional SFP (Small form-factor pluggable transceiver) modules like those from Embrionix are required: one for input and one for output. Each of the SFPs is equipped with two HD-SDI connectors. The Viz Engine also supports SDC-01, SDC-02, and SDC-03 protocols from SAM (now Grass Valley) to obtain telemetry data when an X.mio3IP card is running in 2022-6 mode for transport of high bit rate media signals over IP networks. This new iteration of Viz Engine offers compositing NDI (NewTek’s royalty-free Network Device Interface) and SDI (Serial Digital Interface) inputs, streaming through WebRTC (Web Real-Time Communication), and up to 16 RTP (Real-time Transport Protocol) stream inputs. With this new level of capabilities for an IP-based workflow, the system can offer HDR (High Dynamic Range) video on both input and output as well as DVE clip playback to enable end-to-end live UHD production. 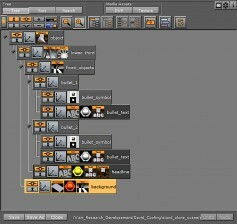 The Viz Artist Scene Tree consists of containers that provide a logical visualization of all the properties in a scene. This new software can import 3D models with pre-defined animations as well as being driven by live motion capture being streamed directly to it. Vers. 3.11 also introduces bones and skin-based mesh deformation, sometimes called skeletal animation, in organic modeling. For more information about Vizrt's latest product introductions see my story on the new Viz Story 1.6, Viz Trio 3.2, Viz Multiplay 2.4, and Viz Mosart 3.9.